Skype is one of the fastest growing internet phones in the world. Even here in my own place, if people are not using Yahoo Messenger, they are using Skype. 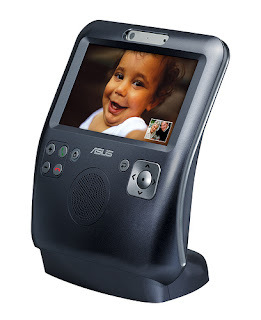 One of the main features of Skype is their development of their own video phones that you can connect in your own PC. All you need is an internet connection. 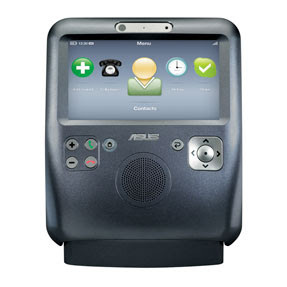 Asus AiGuru SV1 is not a cellphone, but an internet phone. Asus AiGuru SV1 gives full video conferencing using PC and an internet connection. It is very straight forward to use. You can use a network cable to connect it to your PC or you can use it wirelessly. And of course it is easier to use it wirelessly. All you have to do is to enter your WEP or WPA key via the cursor key and on screen keyboard. It is very portable and flexible. The housing is adjustable and it comes with rechargeable batteries. With these features, you can easily move it around the house. Some people who already have this said that the on-screen keyboard is a little fiddly but using a laptop/pc keyboard and mouse makes it easier to use.